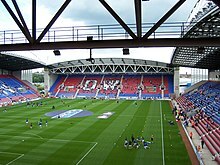 ويجاان اتلتيك (انجليزى:Wigan Athletic F.C. ), ده نادى انجليزى لكوره قدم, اتآسست سنه 1932, ومكانها فى مدينه ويجان, وعندها ستاد رياضى اسمه ستاد دى دبليو. ↑ "Dave Whelan: Wigan Athletic chairman resigns". BBC Sport. 3 March 2015. Retrieved 3 March 2015. ↑ "1932–78 – The Formation of Wigan Athletic". Wigan Athletic F.C. Archived from the original on 13 April 2012. Retrieved 23 September 2011. ↑ "Wigan Athletic". Historical Football Kits. Retrieved 23 September 2011. ↑ Rundle, Richard. "Wigan Athletic". Football Club History Database. Retrieved 23 September 2011. الصفحه دى اتعدلت اخر مره فى 5 ديسمبر 2018,‏ 10:29.